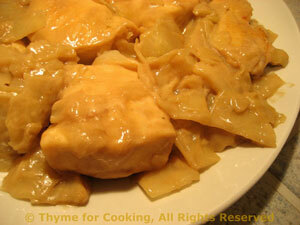 Baked Chicken Breasts with Creamed Cabbage, Thyme for Cooking easy recipes. A bit of crème fraiche or yogurt add a creamy taste to the cabbage. I cut the chicken breasts in half for easier serving. Heat oil in large nonstick skillet. Add onion, paprika and chicken breasts. Sauté until onion is tender and chicken is golden, about 10 minutes, turning the chicken once. Remove chicken breasts. Add cabbage to skillet and stir-fry until wilted, about 5 minutes. Pour chicken stock over the top and lay the chicken breasts on the cabbage. Cover and bring to a boil. Reduce heat and simmer for 20 minutes, until cabbage is tender. Stir in vinegar and yogurt. Spoon around chicken and serve.